On Wednesday, August 5, the next major traffic shift will occur where one lane of traffic in each direction will continue, however, they will shift to one lane on each side of the new median. 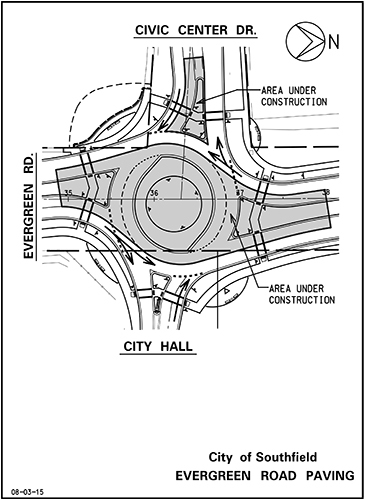 The Civic Center Drive intersection will no longer utilize traffic signals and will have limited traffic movements as we enter a ‘preliminary-roundabout’ phase to enable the completion of the roundabout. City Hall will not be accessible at the Civic Center Drive entrance for southbound or eastbound traffic during this time. Southbound traffic must use the library entrance to enter City Hall. Traffic leaving City Hall at Civic Center Drive will only be able to turn right at Evergreen. Traffic on eastbound Civic Center Drive will only be allowed to turn right (south) at Evergreen. These restrictions will continue for approximately two weeks. For additional project information, visit the City’s Web site at www.cityofsouthfield.com and click on the ‘Construction Projects’ link under ‘Highlights’ on the homepage. Every effort will be made to minimize the inconvenience to area residents. Should you have a complaint or question, please notify the on-site inspector or one of the contacts listed below. Thank you.